This is Wayback Wednesday, your midweek blast from the past! In this feature, we dig into the archives, look back at the history of basketball gaming, and indulge in nostalgia. Check in every Wednesday for retrospectives and other features on older versions of NBA Live, NBA 2K, and old school basketball video games in general. You’ll also find old NLSC editorials re-published with added commentary, and other flashback content. Michael Jordan is the greatest player in the history of basketball. There, that’s a suitably controversial statement to open an article with, these days. For a long time, that was an acceptable assertion to make, but now it seems you’re a bitter old hater if you dare to suggest that there are arguments in favour of teams and players from older eras being superior. Well, contrary to some of the comments that I’ve read on YouTube lately, I would disagree that LeBron James is “clearly better than Michael Jordan”, and that the upcoming season will establish that “fact” once and for all. That’s not a knock on LeBron, by the way; MJ just happened to be pretty good. Anyway, that’s a debate for another time. At the very least, most fans and analysts would agree that Michael Jordan is one of the best players we’ve ever seen, and one of the most significant and influential people in the history of basketball. During his career, he dazzled fans with his play, and his combination of highlights and success on the hardwood in turn sold a lot of merchandise. In retirement, his brand has remained just as strong. It’s no surprise that Visual Concepts made him the first retired player to appear on the cover of their game, when he became the face of NBA 2K11. As I’ve previously discussed, Michael Jordan has an interesting history with basketball video games. Because His Airness retained exclusive rights to his likeness, he was absent from several classic games in the 90s, including all of the ones released during his second run with the Chicago Bulls. His rumoured asking price no doubt kept him out of a lot of titles, so it was a big deal when he was included as a Legend in NBA Live 2000. He did appear in both NBA Live and NBA 2K during his run with the Washington Wizards, but after his last official appearance as a Legend in NBA Live 2004, he was absent from basketball video games for a long time. In late May of 2010, Jon Robinson reported on ESPN.com that Michael Jordan was set to grace the cover of NBA 2K11. The news certainly piqued my interest, as I was still struggling to get into the NBA 2K series at the time, and we hadn’t fully committed to covering it here at the NLSC. While I could appreciate all the great things it was doing, I just wasn’t a fan of 2K’s control scheme. On June 2nd, MJ was officially announced as the cover player for NBA 2K11. I’ll always remember that day, as I’d gone out the night before, and crashed at a friends place. When I got home and saw the news, I had to shake off the cobwebs and punch up a bulletin! The mere fact that Michael Jordan was on the cover of NBA 2K11 and going to have a presence in the game was exciting enough, but then on July 22nd, Visual Concepts confirmed that the game would feature the Jordan Challenge. I’m sure that most of you are aware of what it entails, but for those who don’t know or don’t remember, the mode features ten of MJ’s most noteworthy games, which users are challenged to replicate. This meant the inclusion of ten of MJ’s Chicago Bulls teams, as well as their respective opponents. While some players were excluded for legal reasons, the big names were all accounted for. Needless to say, that was a huge deal. Classic teams have been a staple of basketball video game Wishlists for as long as I can remember, and issues securing the appropriate likeness rights for all the players have always seemed to shut down the idea. Visual Concepts finally made it happen in NBA 2K11, in the form of a fun mode that was a great retrospective of Michael Jordan’s career. A lot of care went into the authenticity, with era-specific faces for MJ, realistic animations for his jumpshot and various moves, and even a unique facial animation giving him his wagging tongue. It was all very impressive, and being a huge MJ fan, it was awesome to see. Completing all ten games in the Jordan Challenge unlocked MJ: Creating a Legend, which was basically a spinoff of My Player (now MyCAREER) starring Michael Jordan. In the mode, gamers were able to choose a team for a young MJ and play through his career, creating a new legend in the process. For those who wanted to unlock the mode straight away, that could be done via a code. In subsequent years, Creating a Legend would become a generic alternative to My Player/MyCAREER, in which gamers could choose to play with any current NBA player. Although the cancellation of NBA Elite 11 was certainly a factor, the presence of Michael Jordan in NBA 2K11 no doubt played a huge role in the game selling over five million units. The game is still regarded as one of the best in the series, and firmly established NBA 2K as the dominant basketball gaming brand. While NBA 2K had pulled ahead of NBA Live in sales beginning with NBA 2K9, and was already garnering more favourable reviews at that point, I would suggest that their partnership with Michael Jordan gave the brand a significant boost, and a considerable amount of mainstream attention. 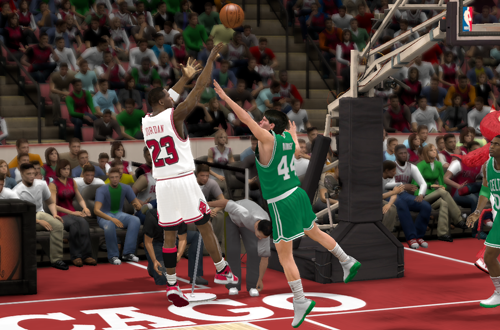 With a lockout delaying the start of the 2012 season, Visual Concepts decided to build upon the Jordan Challenge, and double down with even more historical content in NBA 2K12. The result was NBA’s Greatest, which spotlighted fifteen NBA Legends (including Michael Jordan, of course), added more historical teams, and included authentic, era-specific presentation. It lacked the in-game goals of the Jordan Challenge, instead simply requiring gamers to win each game to unlock all of the teams, but the mode was still more than satisfactory. 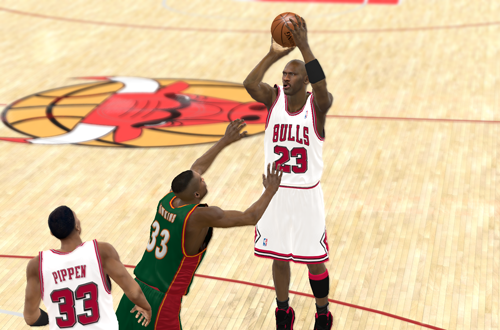 MJ was one of three cover players for NBA 2K12, the others being Larry Bird and Magic Johnson. Since then, Visual Concepts has continued to add new historical content. NBA 2K13 brought us the entire 1992 Dream Team – even perennial holdout Charles Barkley – to challenge the 2012 Team USA squad. According to a recent leak, the Dream Team is set to return as a pre-order bonus in NBA 2K17. Twelve new historical teams were added in NBA 2K16, including some interesting choices. Michael Jordan and other former players have become sought after cards in MyTEAM; I was certainly excited when I was lucky enough to draw a 1993 MJ card in NBA 2K14! We may look forward to the future, but since NBA 2K11, we’ve also been able to enjoy the past. Just as the real Michael Jordan changed the sport of basketball, so too did his virtual counterpart have an impact on basketball video games, long after he hung up his Air Jordans. The bar has been set very high for historical content moving forward; Decade All-Star teams, a small selection of classic teams, and a lack of authentic animations for retro players will no longer cut it. 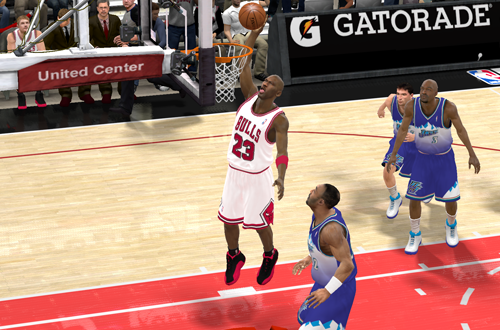 The NBA 2K series has boasted some fantastic historical content over the past six years, and it all started with Michael Jordan in NBA 2K11. Hopefully, we’ll get some more exciting content spotlighting His Airness, and other NBA Legends, in the years to come. 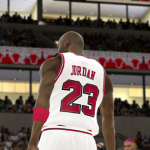 Monday Tip-Off: How Much Does It Cost To Get Michael Jordan In A Video Game? Great game it was to hard. I really love NBA 2k13 and NBA 2k12! Does anybody here have the last official rosters for NBA 2k12 and NBA 2k13 Playstation 3? Thank you very much! No, and this isn’t really the place to ask, as it has nothing to do with the article. I’ve removed your other off-topic comment; please don’t spam the comment sections or the Forum with requests, as it’s kind of rude. As I explained in the Forum, you’re probably out of luck here. Those games are a few years old now, and most of the people in the community who play them are on PC. Not a lot of console files get shared here; they’re most welcome, of course, but we don’t see a lot of them.